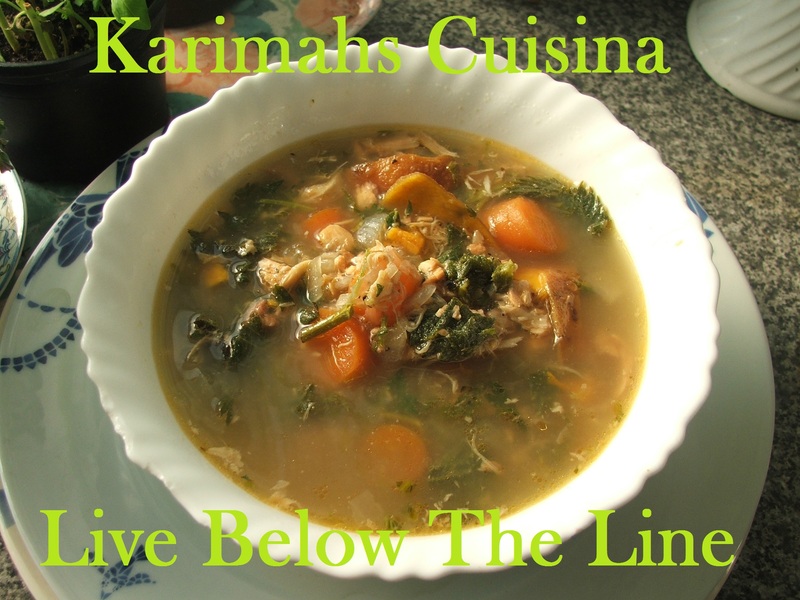 This LIVE BELOW THE LINE is a team effort from Karimah Cuisina’s members and VIP volunteers, this recipe comes from an idea from one of our older, wiser mature members, she reminded us of the fish heads that we buy in White chapel market in the east end of London. A pound a day in the UK is not really enough for optimum nutrition so we decide to go foraging for nettle, dandelions and anything we could get at this time of year. With a bit more research we found that salmon and nettle soup was something the American Indians use to and still eat, so we knew we were on the right track. Nettle are packed with iron and vitamin c and are still free from the clutches of most major supermarkets, so go out and get yours. You will need gardening gloves or rubber gloves, to be used right up until the point they go into the pot, after that it’s all plain sailing and they are just like spinach. Salmon and nettle soup 3 portions , this not a great soup the next day. Leave the fish head, spine and bones to cool down, save scotch bonnet pepper if you can find it. When the fish is cool, take the flesh off the fish head and spine and place in clean bowl, some people like to eat the eyes. There you have it a cheap tasty soup.